It does not get any easier for Kieran Keane's Connacht as they head to the home of the Guinness PRO 14 champions Scarlets. The Connacht coach, obviously unhappy with their 17-15 loss to Cardiff at the Sportsground, says it is time to move on now the review is complete. "We haven't been able to lament anything, we are not feeling sorry for ourselves, we are just moving on," he says. "Wins are great, but you generally get what you deserve in this professional sporting world, and we are getting there. We will make a statement sooner or later." Keane faces another Kiwi coach, Wayne Pivac, who led the Scarlets to championship victory over Munster last season, 12 years after they won the inaugural title. They are also in scoring form this season, having racked up big wins over Southern Kings, Zebre and Edinburgh last weekend, with only Ulster's 27-20 halting their clean sweep. Their pedigree is matched by this season's statistics - in nine categories, the Scarlets lead three (line-out success 95 per cent, turnovers won 41, offloads 72 (Connacht 48 ), and they appear in eight. Both Connacht and Scarlets have similar tackle success, 90 per cent and 89 per cent respectively, while Connacht, with seven line-out steals, are also second highest in that category. "Scarlets are expansive, very well skilled, and a well drilled team," says Keane." We are going over to beat them obviously. We have put in place a plan that we think could trouble them, but they are a quality side, and obviously champions - you don't become champions for nothing. "Decision making has really been focal point for us. We have hard workers, we have good players and we have structures they are coming to grips with that will create opportunities, which we haven't been able to exploit yet. So it's about putting a little bit of polish on the rough diamond which is what we are looking to achieve. Some good news is the likely return of Tiernan O'Halloran at fullback after suffering a hip injury against the Dragons, but it is a week or so too early for fellow Pro 12 winners Matt Healy, who returns to training next week, and Niyi Adeolokun "in the coming weeks", while in the pack James Cannon has a minor thigh strain, and Naulia Dawai is getting close to a return to the training paddock, while lock Andrew Browne remains sidelined with his Achilles issue. The injuries have obviously affected Keane's ability to include key players this season. "I'm not going down the avenue of selecting a first XV because it is a long arduous season. It is more about minutes, monitoring people daily, weekly, and monitoring form, GPS, training, mistakes that possibly creeping in, energy levels, etc, so definitely not in the position where we have a top 15." 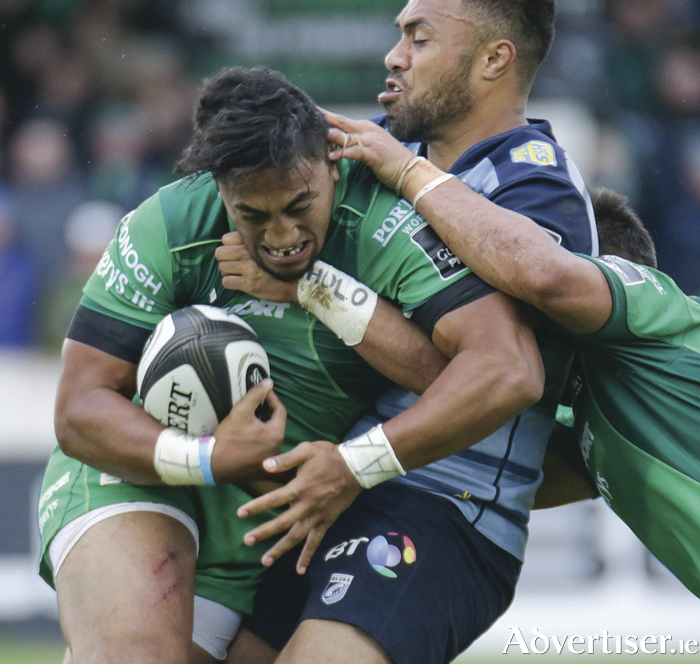 It has been a tough baptism for Keane with Connacht now having lost three of their four opening games, the latest against Cardiff at the Sportsground last Saturday. "We did lose the game in the last two minutes, but if we had done other things better, we would not have been in that position. We didn't use the ball well, and we didn't use the conditions well, but were are learning. "We knew we had to be combative against Cardiff. We had planned for it, worked hard all week on various things, and we were confident we were well prepared, but we didn't fire a shot. To lead by three points with that wind behind was clearly never going to be enough, and so it proved." It seemed harsh for the home side, having done all the work against the wind to take a 15-10 lead, but handing possession back to Cardiff from the kick off, followed by woeful defence in the last play, allowed centre Halaholo to saunter over for his second try to level the match, and replacement Jarrod Evans added the conversion for their first Pro 14 win this season. "I put it down to panic. When I looked from up on high, you could see everything unfolding from that scrum, everybody was too tight, nobody was looking up, everybody was trying to react with their gut and not their brain. They weren't talking to eachother, and there about five people on two players, so that creates space for other team - that is defence 101. "But you know, you have to take into consideration that they had fought all that way back, and they were playing with their heart and they were playing for their crowd and for their families, and they showed a lot of guts and determination, but the smarts went out the window in the last minute and a half." Having opened with an 11th minute penalty from centre Craig Ronaldson, Connacht spurned clear-cut chances in that opening half, and struggled to impose themselves at the breakdown where they conceded a host of penalties. They were not helped when John Muldoon was yellow carded, deemed to have tackled a player without the ball, and minutes later Ultan Dillane conceded a penalty, from which centre Willis Halaholo scored, with Shingler adding the extras. The home side stepped up their intensity after the restart and were rewarded with two tries - a third effort was denied by TMO - but the home side handed the platform to Cardiff in the final two minutes and they paid the price. "We are learning the hard way, no other way to say it really," said Keane. The learnings may take some time. Keane is working on new structures with a different coaching team and a young group of players - only five on Saturday were starters in the PRO 12 final. "Every gig I have done over the last 37/38 years has been tough. You just have to ride them, ride the tough bits." Connacht: D Leader, C Kelleher, B Aki, C Ronaldson, R Scholes, ADeegan, K Marmion, D Buckley, A Heffernan, F Bealham, U Dillane, Q Roux, E Masterson, J Butler, J Muldoon ©. Replacements, S Ili for Scholes (HT ), T Farrell for Ronaldson (51 ), C Carey for Bealham and E McKeon for Masterson (63 ), G Thornbury for Roux (65 ), S Delahunt for Heffernan and C Blade for Marmion (67m ), D Coulson for Buckley (72 ).